Breaking news at this hour! 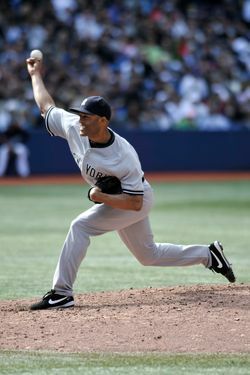 Mariano Rivera just recorded his 602nd career save, breaking Trevor Hoffman's MLB mark and earning a spot atop the record books. Thanks primarily to active bats in the early innings, the Yankees took a 6–4 lead into the ninth inning against the Twins. Rivera strode out in front of an excited crowd (which was totally rooting for the Yankees to get outs and preserve the save opportunity in the previous frame) and made quick work of the three batters he faced. He threw fourteen pitches, primarily cutters, and struck out Chris Parmelee looking to end the game and cement his place in history. After being mobbed by his teammates, the ever-modest Rivera was convinced to stick around on the mound a bit after the final pitch, receiving a standing ovation from the entire Yankee Stadium crowd, as well as both dugouts. Want video? Here you go. Massive congratulations to Rivera for the record, though Mo would certainly tell you he's most personally pleased with yet another Yankee victory.